Layout - ARAUATU. A New Zealand Sn 3 ½ scale layout. The name ARAUATU comes from what occurred during the construction of the layout - A Row or Two, which indicates how some decisions were made. It is a highly detailed Sn 3.5 model that includes Caversham station, with excellent Southern rural and urban scenery. This HO layout was completed three days before the 2008 show with two circles of track. Thomas the Tank Engine will be racing around the top layer, while Bertie will be circling the lower level at a similar speed. The old 2008 layout is shown above, but this has been vastly improved in that past two years with animation, and a circus tent. ORSNOW is an N Gauge layout that was first shown at the 2007 Dunedin Model Train Show. 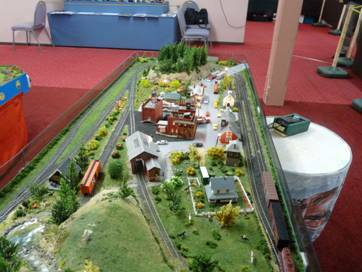 ORSNOW is an N Gauge layout that was first shown at the 2007 Dunedin Model Train Show. It features a loop of track with a poor little diesel train whizzing around at full speed that can be controlled by a child. In the centre of this area is the largest layout, the hosts 9 metre x 3.5 metre HO American Layout that is now called Route 69. U.S. Route 69 is a north–south United States highway that runs south from Albert Lea, Minnesota to Port Arthur, Texas, and the rail line displays some of the trains that may run through that area. A small HO layout that a small steam locomotive runs around. This layout features animated skaters and an animated canoe as well. 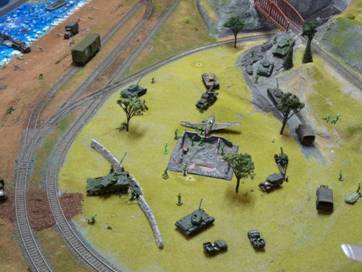 This layout features tank and artillery battles, landing craft and supply trains. A Gn15 layout that features a railway taking quartz from a mine to a working gold mining stamping battery. The image above shows the 2008 layout, but this labour of love has resulted in a large extension since that show and now features many more animations. In the centre of the room is a small OO gauge layout called Butterwick Branch, which is based upon English rural and industrial line. 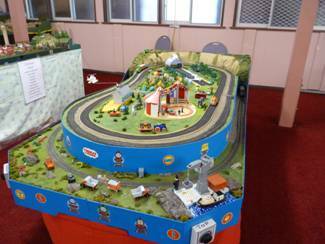 Nearby is another bar where CHRISTCHURCH MODEL SUPPLIES will be displaying a large amount of modelling items for sale. BRITANNIA MODELS are a little further round to your left in another alcove also featuring a large amount of modelling items for sale. Opposite the BUTTERWICK BRANCH there is a bar that occupies the SECOND HAND STAND. This is where you can bring in any unwanted model items for sale. A 10% levy is the cost to you on a successful sale. That completes a tour of the lower floor, but don’t go away just yet. 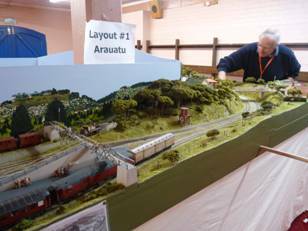 ©2017 - 2019 - Dunedin Model Train Show, Hosted by American Modular Group, Dunedin, New Zealand.